This article is provided courtesy of the U.S. Fish and Wildlife Service. As dawn breaks over Oregon’s Coast Range and the sun’s rays sweep across the headlands and prairies, a female bumblebee stirs to life. Her ocelli sense the sky’s subtle lightening, and her antennae twitch in what appears to be anticipation of the coming day. She flexes her legs and backs out of the thistle blossom she had spent the night in. Awaiting the sun’s innervating warmth, she shivers her flight muscles to slowly bring up her body temperature to 50 or 60 degrees Fahrenheit. If she felt so inclined, she could shiver all the way up to 86 degrees, but this requires precious stored energy—energy that the sun could effortlessly provide in spades. So she waits. Finally the sunlight falls upon her, and within fifteen minutes or so she is warm enough to fly. She takes off from the thistle and flies a lazy circle around it, orienting herself. Her underground nest is a quarter-mile to the east; the best dandelion and thistle patch, a half-mile distant, to the west. Though her brain is the size of a grass seed, she possesses an excellent spatial memory, mastering routes to and from the nest as well as mapping out optimal foraging spots. If she finds an especially fruitful area, she may mark the flowers with pheromone as a sensory reminder, for return trips. She rarely ventures more than a mile or so from her nest, but in the course of her travels she may fly 5 miles per trip in search of the nectar and pollen that bumblebees—along with their close relatives, the honeybees—crave. Each flight requires copious energy, so it pays for her to minimize the output and maximize the return. She flits from flower to flower, quaffing nectar and collecting pollen. All the while her senses are on alert—she has no ears, but she can feel even minute vibrations in the air—ready to detect any predatory advances. Despite her aposematic black-and-yellow pile, the threats are legion: birds, spiders, wasps, robber flies, even rogue bumblers of the subgenus Psithyrus, known as cuckoo bumblebees. These bees have lost the ability to gather pollen, and so they rely on the diligence of others to supply food for their young. Female Psithyrus bees—who also sport yellow, black, and sometimes orange piles—actively attack other bumblebees and invade their nests, killing the queen and “enslaving” the workers. 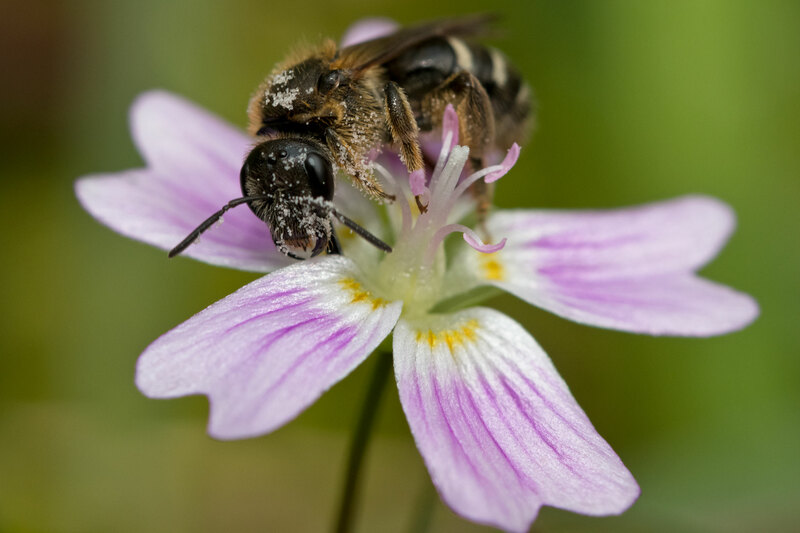 If bees have it in them to be devious at all, Psithyrus species are downright dastardly. But on this trip there is nothing injurious, nothing but other pollen-grubbing bees and the occasional hover fly. She fills her corbiculae and heads back to the nest. Tucked into an old mouse’s burrow, the nest is small by bee standards, numbering only sixty individuals. There is no honey, just rows and rows of eggs and larvae. The queen, fat and furry, lays eggs all day; the workers procure pollen to feed the young. Because it is early in the season, all of the workers are female—a feat achieved by the queen through hormonal disruption and good ol’ fashioned physical intimidation. This sisterhood is not sterile, and it can lay viable eggs if given the chance. By the end of the season, however—and each nest is a season-long affair—the beleaguered queen’s pheromonal influence wanes, and male bees are hatched that can fertilize eggs, giving rise to a new queen.